Showing items in category New Hebrides, sorted by newest listed first. NEW HEBRIDES - 1912 2 1/2d rate cover to UK used at PORT VILA. 1912 (SEP.17.) 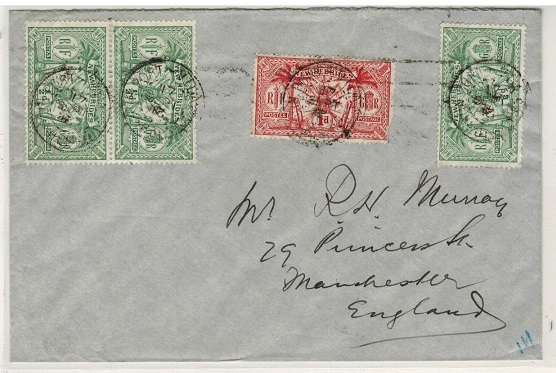 cover addressed to UK bearing 1/2d (x3) and 1d (SG 18-19) tied by PORT VILA cds with the '2' in 1912 inverted. NSW/SYDNEY roller transit b/s. NEW HEBRIDES - 1924 2d rate postcard (unaddressed/no message) cancelled POST CONDOMINIUM. 1924 (DEC.6.) use of unaddressed picture postcard depicting 'Mission Catholique de Port Sandwich' (no message) bearing 2d grey (SG 20) applied to picture side cancelled POST CONDOMINIUM/NELLES HEBRIDES cds. NEW HEBRIDES - 1922 1d rate postcard (unaddressed/no message) cancelled PORT VILA. 1922 (NOV.18.) 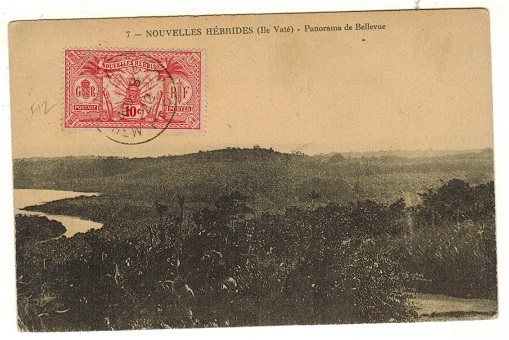 use of unaddressed picture postcard depicting 'Panorama de Bellevue' (no message) bearing 1d red (SG 19) applied to picture side cancelled PORT VILA/NEW HEBRIDES cds. 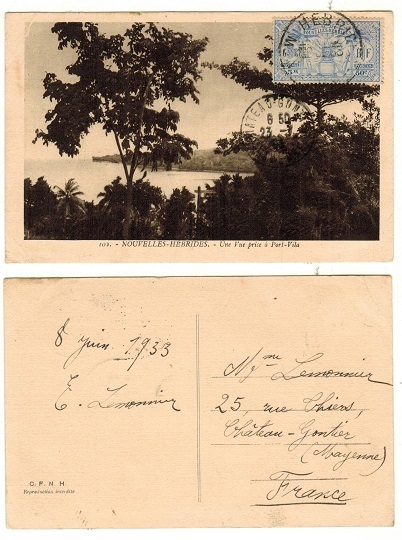 NEW HEBRIDES - 1923 1d rate postcard (unaddressed/no message) cancelled PORT VILA. 1923 (APR.6.) 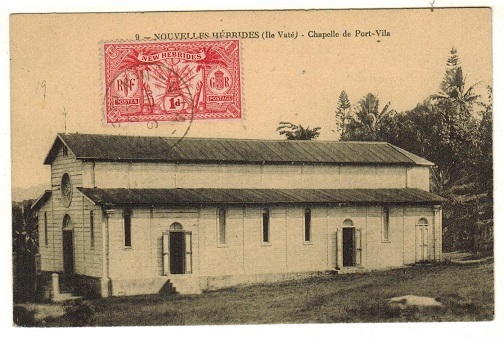 use of unaddressed picture postcard depicting 'Chapelle De Port Vila' (no message) bearing 1d red (SG 19) applied to picture side cancelled PORT VILA/NEW HEBRIDES cds. 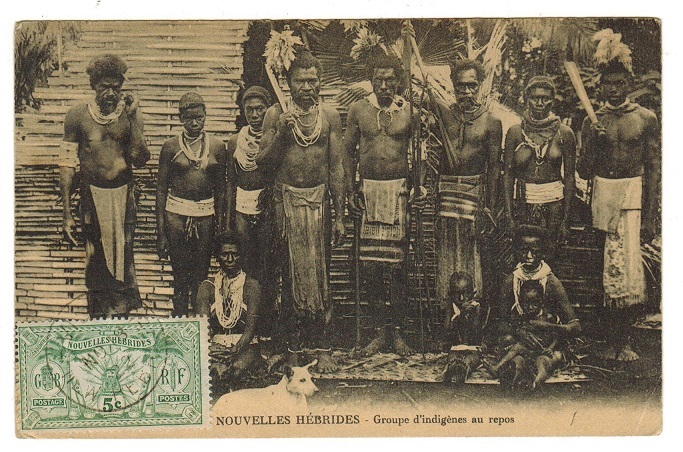 NEW HEBRIDES - 1933 5d rate postcard use to France. 1933 (SE.8.) use of picture postcard addressed to France depicting 'Une Vue Prise a Port Vila' bearing 5d (50c) French inscribed adhesive tied to picture side by NEW HEBRIDES cds. 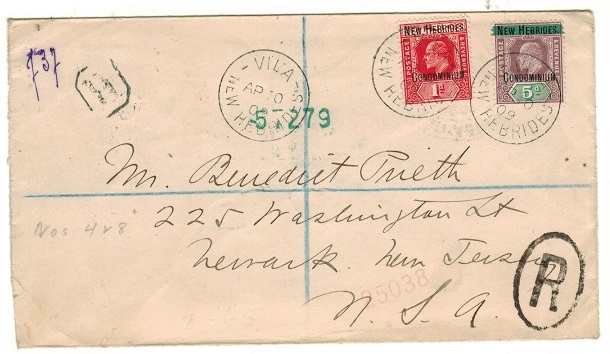 NEW HEBRIDES - 1909 6d rate registered cover to USA used at VILA/NEW HEBRIDES. 1909 (AP.10.) 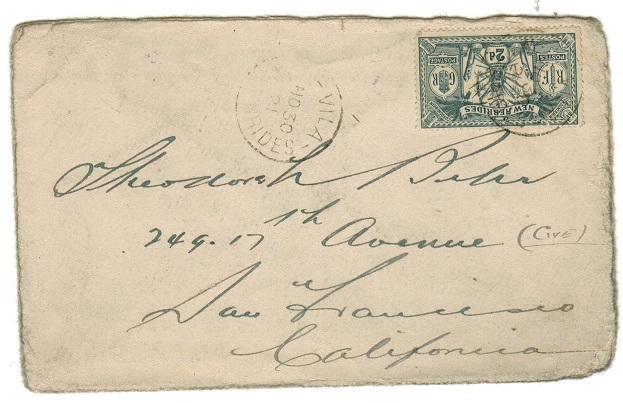 registered cover addressed to USA bearing 1d and 5d adhesives tied by s/r VILA/NEW HEBRIDES cds. NEW HEBRIDES - 1910 5c,10c, 25c and 50c (SG F6-9) on piece tied NELLES HEBRIDES/PT.SANDWICH. 1910 5c, 10c, 25c and 50c adhesives overprinted New Caledonia overprinted NOUVELLES/HEBRIDES/ CONDOMIUM (SG F6-F9)) each on small piece and tied by scarce NELLES HEBRIDES/PT SANDWICH. NEW HEBRIDES - 1925 'CHIFFRE TAXE' (Postage Due) series fine mint condition. SG FD53-75. 1925 'CHIFFRE TAXE' (Postage Due) series of five in fine mint condition. SG FD53-75. NEW HEBRIDES - 1920 10c on 25c blue PLATE 8 mint gutter marginal block of 50. SG F33a. 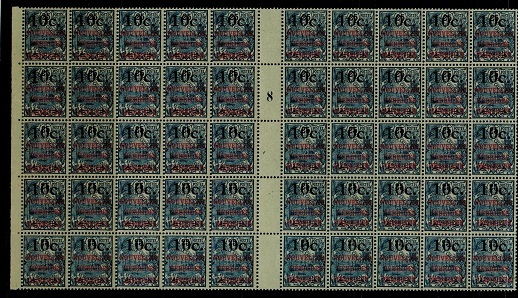 1920 10c on 25c blue on greenish paper adhesive in a fine gutter marinal mint block of 50 (overall toned gum) and showing the '8' control in the second row down. SG F33a. 1955 (10.8.) cover addressed to Australia bearing 30c adhesive struck by NOUMEI handstamp in black with NOUMEA/NOUVELLE CALEDONIE cds alongside. Some tone spotting but a diffilcult pre-paquebot strike applied to letters posted on board on the New Hebrides to New Caledonia run. 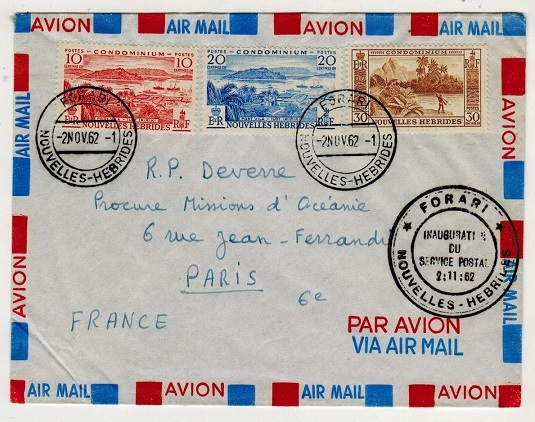 NEW HEBRIDES - 1962 first flight cover to France. 1962 (NOV.2.) first flight cover addressed to France bearing 10c, 20c and 30c adhesives tied by scarce FORARI/NOUVELLES HEBRIDES cds's. Black FORARI/INAUGURATION/DU/SERVICE POSTALE h/s at lower right. NEW HEBRIDES - 1937 2 1/2d rate cover to UK used by SYDNEY PAQUEBOT. 1937 (AUG.3.) 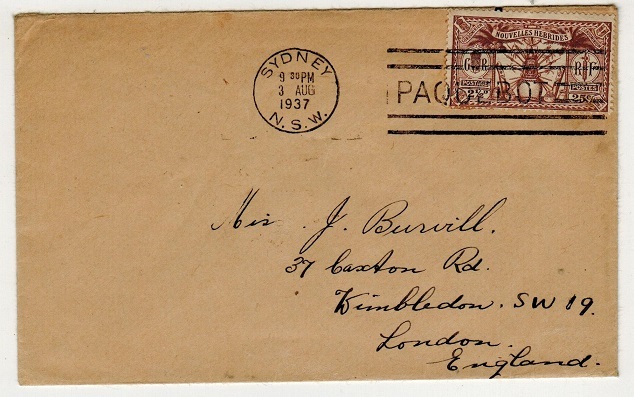 cover addressed to UK bearing 2 1/2d (25c) brown (French) adhesive tied by PAQUEBOT strike with SYDNEY/NSW cds alongside. NEW HEBRIDES - 1932 1/8d adhesive on local cover used at VILA. 1932 (MY.6.) 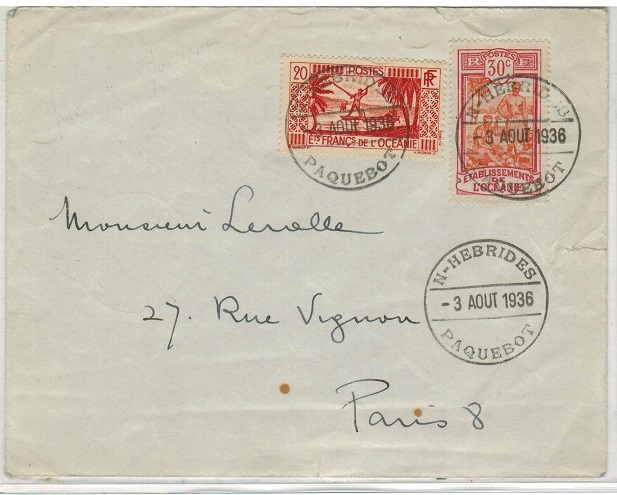 cover addressed locally bearing the French issue 1/8d-2fr violet adhesive (SG F51) tied by NEW HEBRIDES/VILA cds. A scarce stamp on cover. NEW HEBRIDES - 1930 5d rate cover to France used at VILA with strike in 'blue' ink. 1930 (MR.17.) cover addressed to France bearing 50c (5d) French issue (SG F48) adhesive tied by NEW HEBRIDES/VILA cds struck in 'blue' ink. 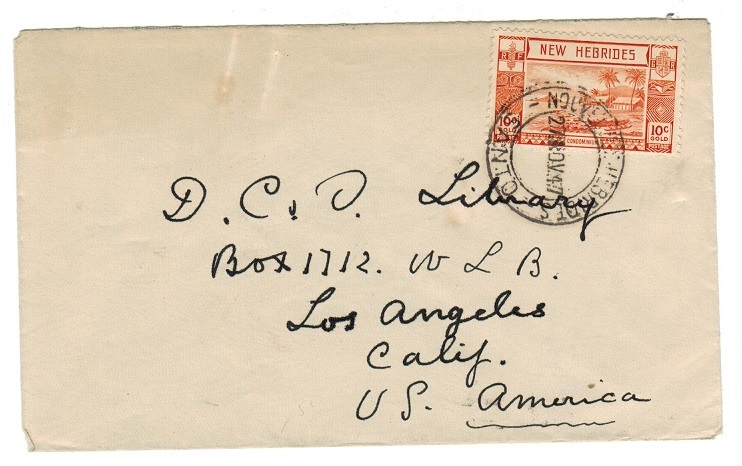 NEW HEBRIDES - 1921 2d rate cover to USA. 1921 (NO.30.) use of 'Burns Philip (South Sea) Coy Limited' envelope addressed to USA bearing 2d grey adhesive tied by VILA/NEW HEBRIDES cds. A little tired but a genuine use. NEW HEBRIDES - 1910 10c red gutter plate pair used at PT.SANDWICH. 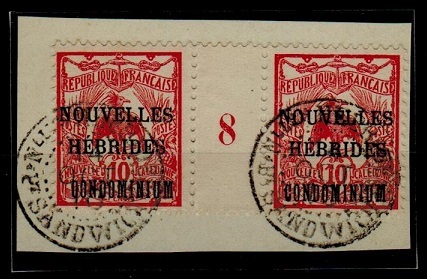 FRENCH - 1910 10c red 'Condominium' adhesive (SG F7) in a fine PLATE 8 gutter pair tied to piece by two complete NELLES. HEBRIDES/PT.SANDWICH cds dated 14.OCT.10. (Proud type D1). 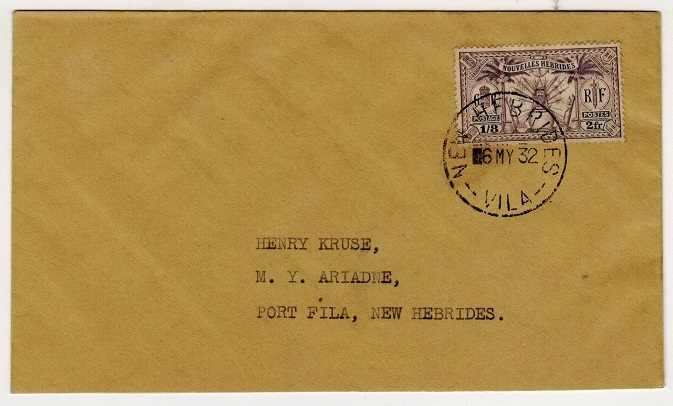 NEW HEBRIDES - 1934 cover to USA used at VILA. 1934 (NO.5.) cover addressed to USA bearing 3d/30c French adhesive tied by NEW HEBRIDES/ VILA cds and complete with the original contents. 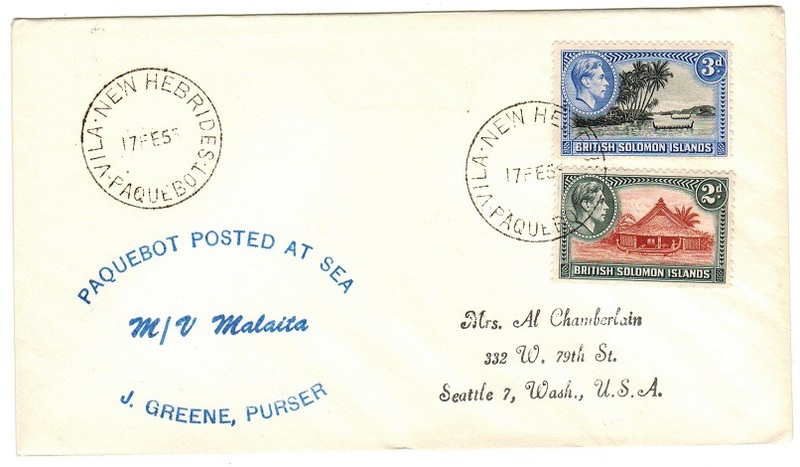 NEW HEBRIDES - 1938 cover to USA using Gilbert and Ellice adhesives at VILA. 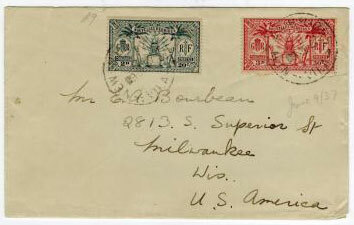 GILBERT USED IN - 1938 (AP.11) cover to USA bearing Gilbert & Ellice Island 1/2d, 1d & 1 1/2d adhesives (SG 27-29) tied by s/r NEW HEBRIDES/VILA cds with similar strike alongside. 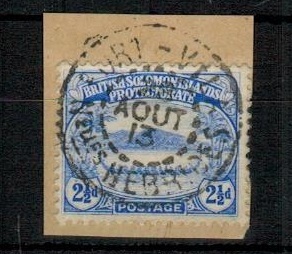 An unusual & scarce use of these stamps in New Hebrides. 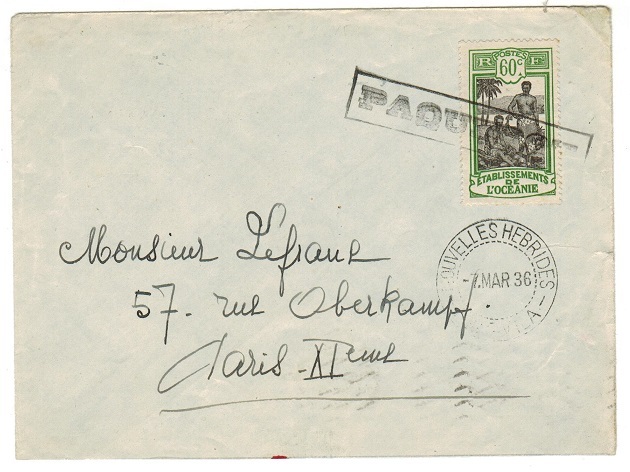 NEW HEBRIDES - 1936 PAQUEBOT cover to France used from VILA/NOUVELLES HEBRIDES. 1936 (MAR.7.) cover addressed to France bearing French Etablissements De L'Oceanie 60c black and green adhesive tied by scarce black boxed PAQUEBOT h/s with NOUVELLES HEBRIDES/PORT VILA cds below. A scarce use of Proud type SL3 which was in use for just 3 months. NEW HEBRIDES - 1913 multi franked registered cover to UK bearing French issues. 1913 (AOUT.28.) 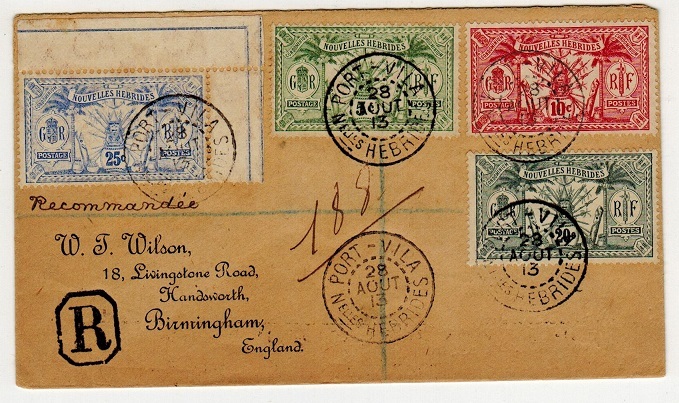 registered 'Wilson' cover to UK bearing the French 5c,10c,20c and 25c adhesives (SG F11-F14) tied by individual PORT VILA/NELLES HEBRIDES cds's. The French issues being far more difficult to find on cover than the British counter parts. NEW HEBRIDES - 1955 'VILA NEW HEBRIDES/PAQUEBOTS' cover to Australia. 1955 (MY.13.) cover addressed to Australia bearing Solomon Islands 'KGVI' 1d and 1 1/2d adhesives tied by s/r VILA NEW HEBRIDES/PAQUEBOTS cds. 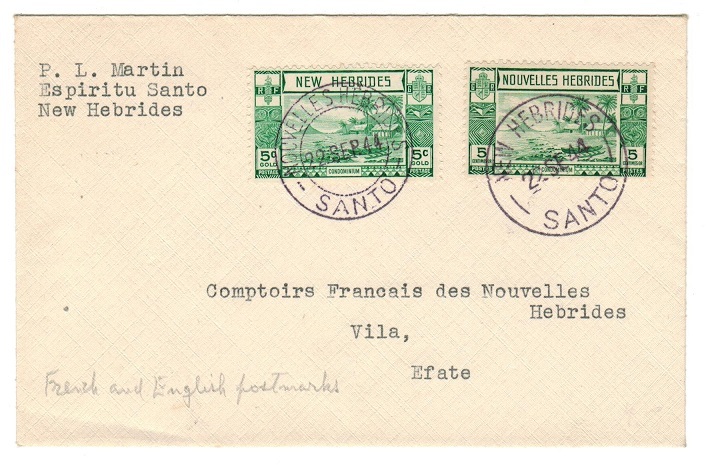 NEW HEBRIDES - 1936 'N-HEBRIDES/PAQUEBOT' cover to France. 1936 (3.AOUT.) 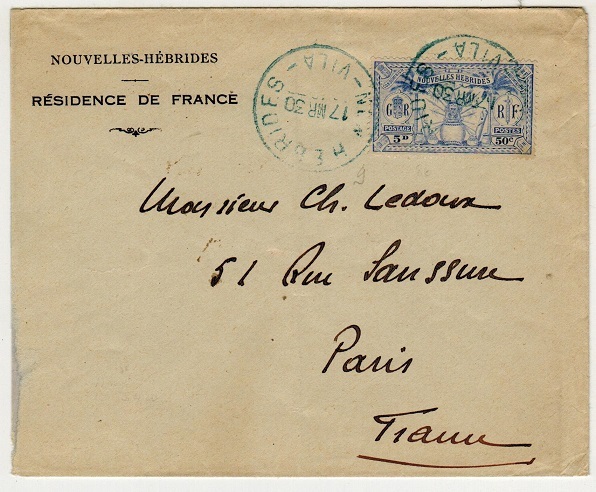 cover addressed to France bearing French De L'Oceanie 20c and 30c adhesives tied by scarce N.HEBRIDES/PAQUEBOT cds's with additional strike below. NEW HEBRIDES/VILA transit b/s and PARIS arrival. 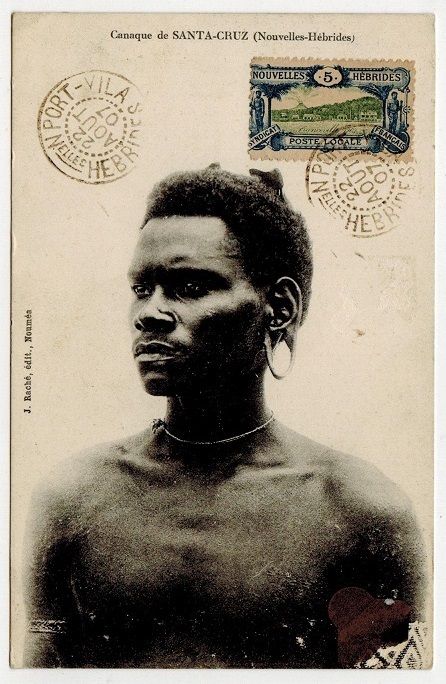 NEW HEBRIDES - (1910) philatelic postcard use with New Caledonia 5c used at PORT SANDWICH. 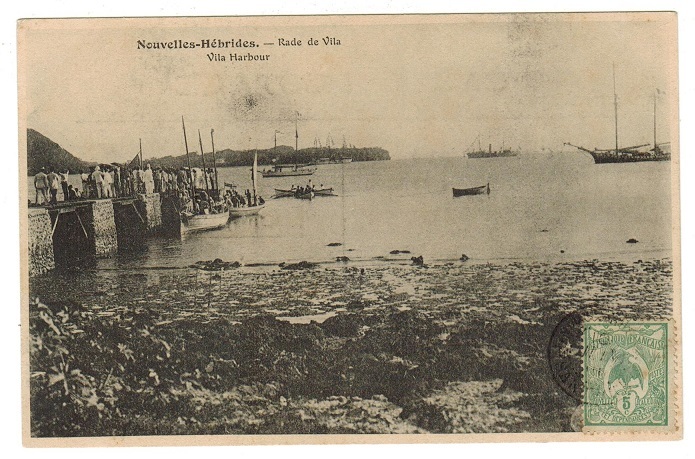 (1910) JUIN.10 use of picture postcard addressed to Noumea in New Caledonia depicting 'Nouvelles Hebrides-Rade De Vila-Vila Harbour' bearing New Caledonia 5c green adhesive tied to the picture side by light NELLES HEBRIDES/PT SANDWICH cds. A philatelic use but a rare cancel so used. NEW HEBRIDES - 1911 registered cover to New Zealand with 5d+6d adhesives tied PORT VILA. 1911 (OCT.11.) 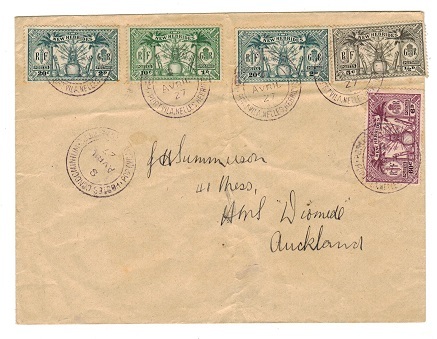 registered cover addressed to New Zealand (scarce) bearing 5d and 6d adhesives (SG 14+15) tied by PORT VILA/NELLES HEBRIDES cds with black octagonal 'R' h/s at left. The cover is a little untidy at top edge from opening and with some light ageing. Also two smal paper mount marks on top reverse edge. TPO/NZ/MAINTRUNK AK (OUT) b/s with s/r WESTPORT and BURNETTS FADE arrival marks from being re-forwarded. A scarce early cover. NEW HEBRIDES - 1923 1/2d rate (unaddressed) postcard use at PORT VILA. 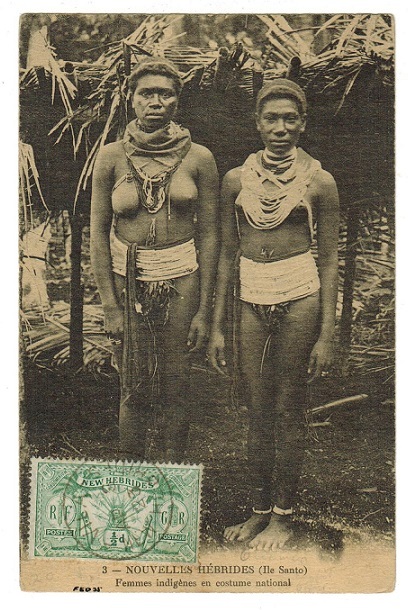 1923 use of unaddressed picture postcard depicting 'Native girls in national costume' bearing 1/2d green (SG18) tied to picture side by VILA/NEW HEBRIDES cds dated AP.3.23. NEW HEBRIDES - 1908 1/2d green and grey green cancelled PORT VILA in 'blue' ink. SG 4. 1908 1/2d green and grey green 'single CA' watermark in fine used condition with part PORT VILA/NELLES HEBRIDES cds of 1909 struck in 'blue' ink. SG 4. 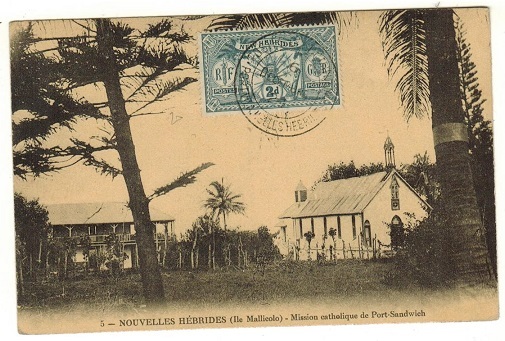 NEW HEBRIDES - 1922 postcard (unused) with 5c (French) issue tied VILA. 1922 (NO.18.) philatelic cto'd use of picture postcard (un-addressed-no message) depicting 'Nouvelles Hebrides-Groupe D'indigenes au repos' bearing 5c (French issue) adhesive on picture side cancelled VILA/NEW HEBRIDES. NEW HEBRIDES - 1907 postcard (no message) with 5c local tied by forged cancel. 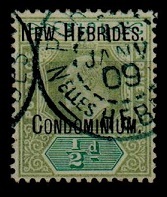 1907 (22.AOUT) use of picture postcard (no message) depicting 'Canaque De Santa-Cruz- Nouvelles Hebrides' printed by J Rache in Noumea bearing the 5c NOUVELLES HEBRIDES blue and green 'Syndical Francais Local' adhesive tied by forged PORT VILA/NELLES HEBRIDES cds with dotted inner circle. No actual post was transmitted by this company. NEW HEBRIDES - 1911 cover to Belgium with New Caledonia set used at PORT SANDWICH. 1911 (JAN.4.) 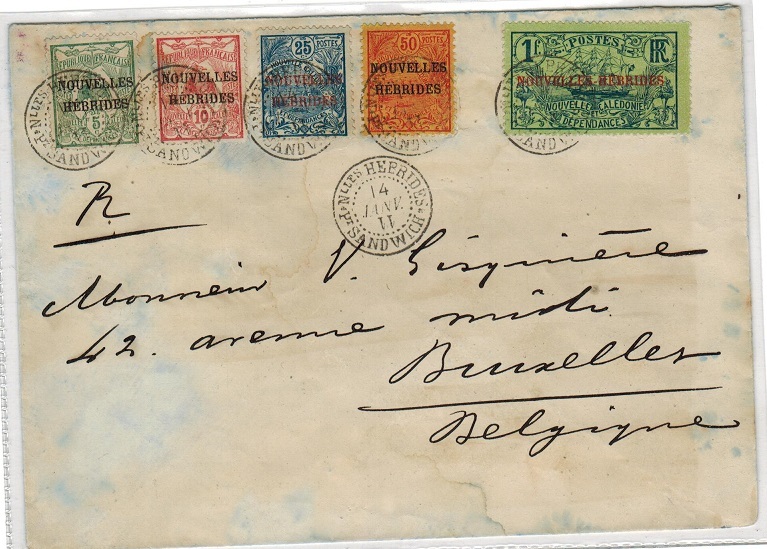 cover addressed to Belgium (affected by water staining) bearing the New Caledonia series of 1908 (SG F1-5) cancelled by very fine NELLES HEBRIDES/PtSANDWICH cancels. The '11' in year slug being inverted. NEW HEBRIDES - 1955 M.V.MALAITA maritime cover to USA with NEW HEBRIDES/PAQUEBOT cancel. 1955 (FE.17.) cover addressed to USA bearing Solomon Islands 'KGVI' 2d and 3d adhesives tied by VILA NEW HEBRIDES/PAQUEBOT cancel with additional strike at left and with blue PAQUEBOT POSTED AT SEA/ MV. MALAITA/ J.GREENE, PURSER h/s at lower left. NEW HEBRIDES - 1949 15c rate cover used on the NEW HEBRIDES/INTER-ISLAND service. 1949 (NOV.29.) 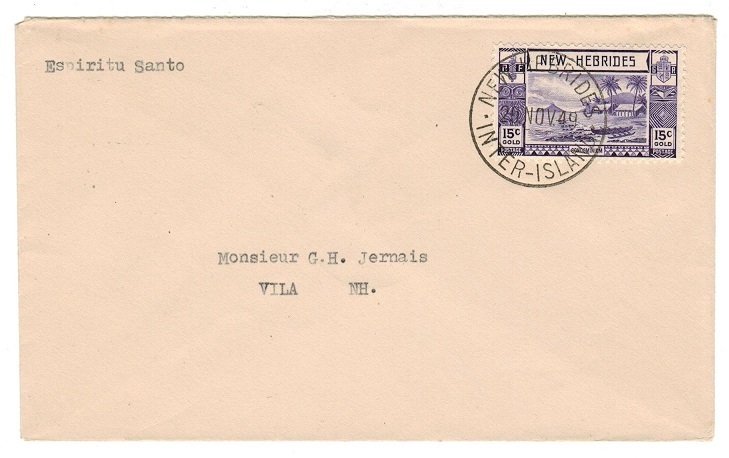 philatelic cover addressed to Vila marked 'Espiritu Santo' bearing British 15c violet adhesive tied by NEW HEBRIDES/INTER-ISLAND cds with additional strike on reverse flap. 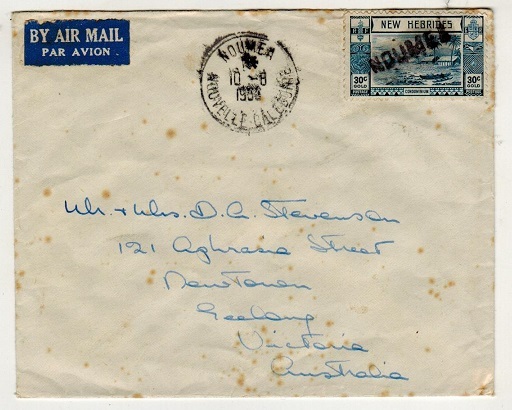 NEW HEBRIDES - 1946 stampless 'Service' cover to USA used at VILA. 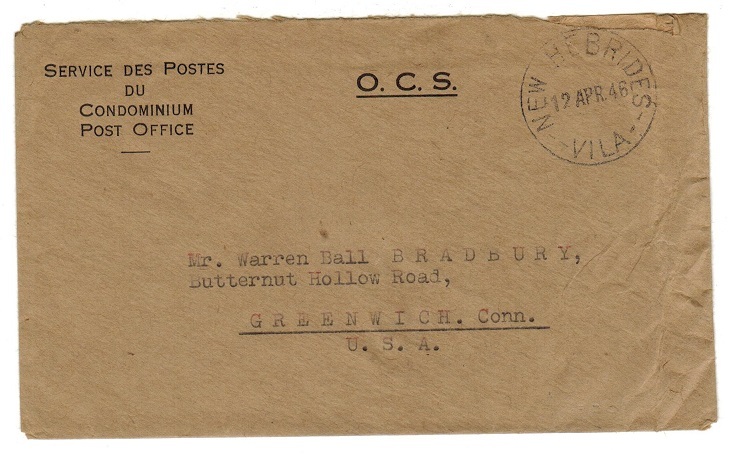 1946 (SPR.12) use of stampless O.C.S. pre-printed official envelope addressed to USA (146x88mm) cancelled by NEW HEBRIDES/VILA cds. 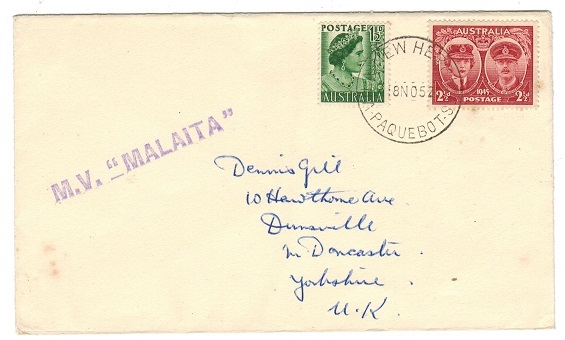 NEW HEBRIDES - 1944 local cover with bilingual cancels. 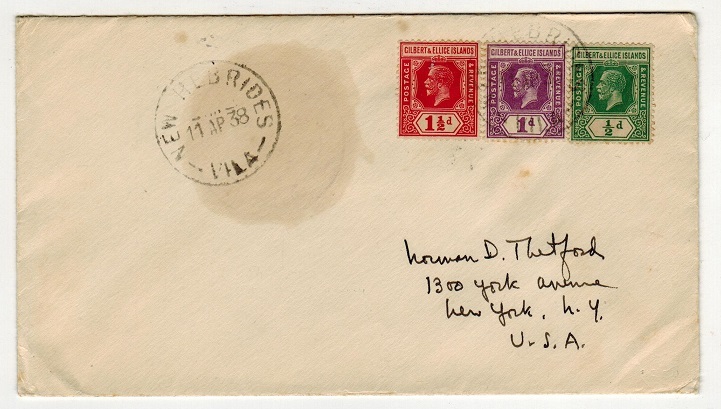 1944 (SEP.22) cover addressed locally bearing both English and French examples of the 5c adhesives tied by individual NEW HEBRIDES/SANTO and NOUVELLES HERBRIDES/SANTO cds's struck in violet. 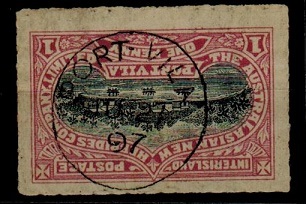 1897 1d black and lilac rose local 'Inter Island' adhesive (B&K L1) cancelled by a complete central s/r PORT VILA cds dated JU.27.97. Unlisted as such. Unusual item. 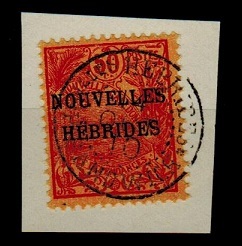 NEW HEBRIDES - 1910 5c (SG F6) used on piece from PORT SANDWICH. FRENCH - 1910 5c green 'Condominium' adhesive (SG F6) tied to piece by complete NELLES HEBRIDES/PT.SANDWICH cds dated 14.OCT.10. (Proud type D1). NEW HEBRIDES - 1910 50c (SG F9) used on piece from PORT SANDWICH. 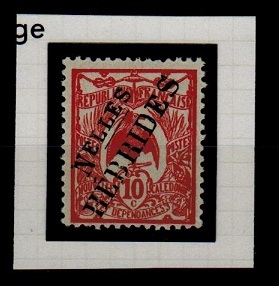 FRENCH - 1910 50c red/orange 'Condominium' adhesive (SG F9) tied to piece by complete NELLES. HEBRIDES/PT.SANDWICH cds dated 14.OCT.10. (Proud type D1). NEW HEBRIDES - 1905 10c NELLES/HEBRIDES overprinted ESSAY. 1905 'New Caledonia' 10c rose-red adhesive overprinted in NELLES/HEBRIDES in black. This was produced in 1907 by the French Colonial office following the ratification of the Convention but the issue was rejected. These are now classed as an essay. NEW HEBRIDES - 1905 25c NELLES/HEBRIDES overprinted ESSAY. 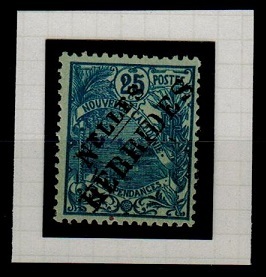 1905 'New Caledonia' 25c blue on pale green adhesive overprinted in NELLES/HEBRIDES in black. This was produced in 1907 by the French Colonial office following the ratification of the Convention but the issue was rejected. These are now classed as an essay. NEW HEBRIDES - 1947 10c cover to USA used at (French) SANTO. 1947 (NOV.27) cover to USA bearing 10c adhesive (SG53) tied by d/r NOUVELLES HEBRIDES /SANTO cds. NEW HEBRIDES - 1953 M.V.MALAITA maritime cover from SANTO. 1953 (13.III.) 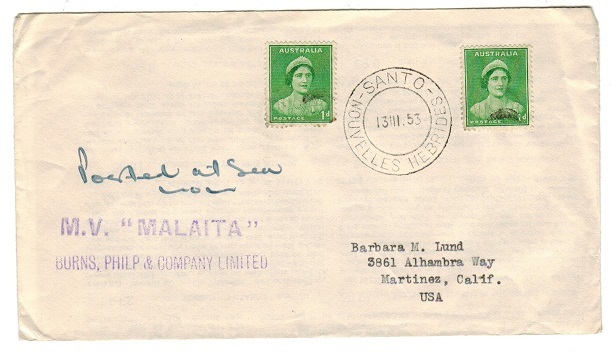 cover addressed to USA bearing Australian 1d green (x2) each struck in the corners by black 'dumb' strike and with d/r SANTO/NOUVELLES HEBRIDES cds between. Marked 'Posted At Sea' in manuscript with violet two lined M.V.MALAITA/BURNS, PHILIP & COMPANY LIMITED maritime strike at lower left. NEW HEBRIDES - 1952 NEW HEBRIDES PAQUEBOT cover with M.V.MALAITA maritime cancel. 1952 (NO.18.) cover addressed to UK bearing Australian 1 1/2d and 2 1/2d adhesives tied by NEW HEBRIDES/PAQUEBOT cds with violet M.V.MALAITA ship strike at left. NEW HEBRIDES - 1927 multi franked cover to 'HMS Diomede, New Zealand' used at PORT VILLA. 1927 (AVRIL.8.) 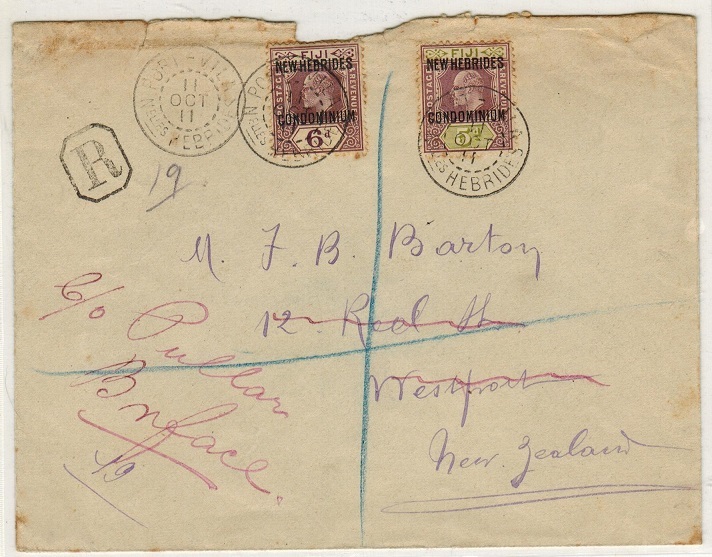 cover addressed to New Zealand (light vertical and horizontal folds ironed out) bearing 1/2d, 1d, 2d (x2) and 6d adhesives (SG 43,44,45+48-scarce) tied by d/r POSTES CONDOMINIUM/PORT VILA.NELLES,HEBRIDES cds's struck in violet ink. NEW HEBRIDES - 1931 cover to UK with French 50c+1f cancelled PORT NELLES. 1931 (JUIN.27.) long 'SERVICE DES POSTES' envelope addressed to USA bearing French currency 50c and 1fr adhesives (SG F48+F50) tied by POSTES CONDOMINIUM/PORT NELLES HEBRIDES cds's. NEW HEBRIDES - 1925 'French' set of 11 all used with INTERISLAND SERVICE cds's. SG F42-52. 1925 series of the 'Nouvelles Hebrides' set of 11 all but the 5f (4/-) being cancelled by NEW HEBRIDES/INTERISLAND SERVICE cds's & all but the 30c & 2f being corner marginal examples. 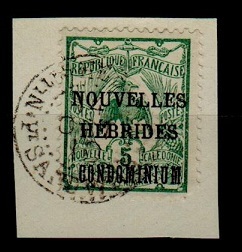 The 4f cancelled NEW HEBRIDES/SANTO. An attractive series. SG F42/52. NEW HEBRIDES - 1925 'Script CA' set of 9 in mint blocks of four. SG 43-51. 1925 Script 'CA' series of 9 in very fine mint blocks of four. SG43-51. 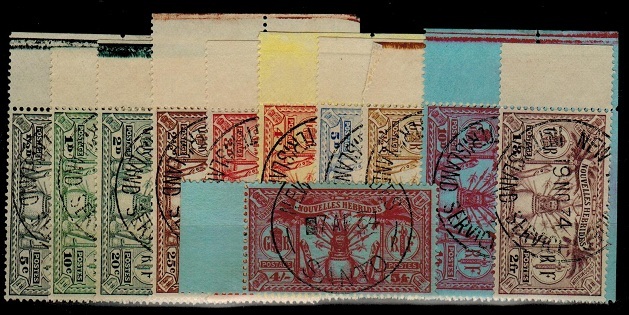 NEW HEBRIDES - 1921 'script CA' set in mint blocks of four. SG 36-39. 1921 Script 'CA' trio 1d scarlet, 2d slate grey & 6d purple each in superb mint blkx4. SG36-9. NEW HEBRIDES - 1925 POSTAGE DUE set in mint condition. SG D1-D5. 1925 POSTAGE DUE series of 5. Very fine mint. SG D1-D5. 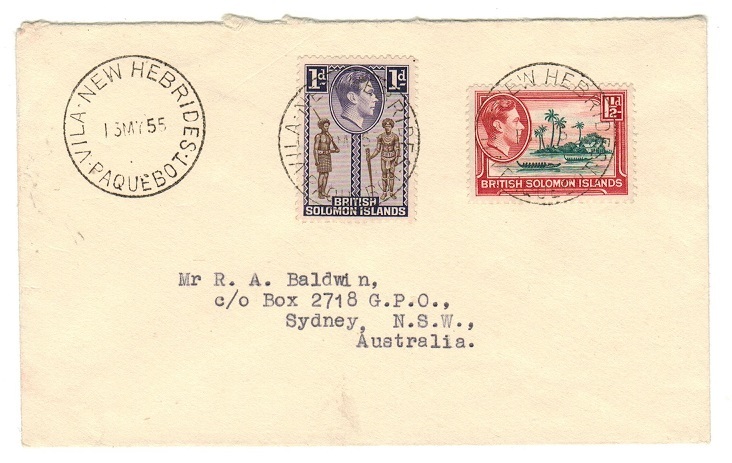 NEW HEBRIDES - 1941 PAQUEBOT cover to Australia. 1941 (DE.4.) 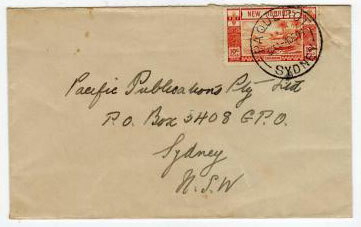 cover addressed to Australia bearing 'British' 10c orange adhesive tied by PAQUEBOT/SYDNEY cds. 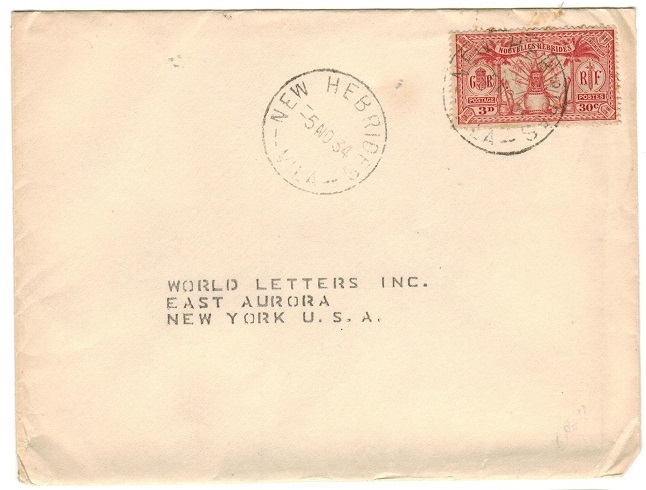 NEW HEBRIDES - 1937 cover to USA. 1937 (JE.9) cover to USA bearing the French 2d (20c) & 3d (30c) adhesives (SG F44+46) tied by NEW HEBRIDES/VILA cds's.